An Unusual Island is a young adult fantasy written by D.L. Finn. When 15-year-old Janine heard that her mom had won a vacation to an unknown island in the Pacific, she envisioned herself sunning by the mansion's pool and enjoying a luxurious and relaxed holiday. Her parents and twin brother, Justin, had other plans in mind as the vacation package included a boat. Janine did manage a few days on the island before the family set off on the small catamaran for adventure on the high seas. The sole landlubber among them, Janine was pretty bored with seeing the endless procession of waves and enduring the lack of privacy in the boat's small cabin. To make matters worse, her parents decided not to let the mansion's staff install internet access on the boat, leaving Janine separated from her best friend and companion, Claire. Her mood abruptly lightened, however, when they spotted an island that had not appeared on any maps, and just in time as a sudden storm was brewing. D.L. Finn's young adult novel, An Unusual Island, is an intriguing blend of fantasy, science fiction and adventure. The story is told by Janine, a 15-year-old who's feeling pretty isolated from her parents and her twin brother, and we learn of their adventures on the island through her eyes. Janine's a die-hard Oakland A's fan and the memories she shares of the games she's watched in the Coliseum are inspired. Finn's unusual island is a remarkable one, and the family's explorations of the seemingly deserted island brought to mind the classic adventure tales of Robert Louis Stevenson, H.G. Wells and Jules Verne. The plot is marvelous and has plenty of action and adventure. An Unusual Island is fast-paced and hard to put down once you've begun reading it. There's a bit of something for everyone in this deceptively slim volume: coming of age, mystery, suspense and mythology. It's a delight to read and it's highly recommended. An Unusual Island by D.L. Finn is an exciting story that revolves around the vacation of Janine, her twin brother, Justin, and their parents. A vacation to a private island is like a dream holiday for the twins. But they are not fully equipped to handle events when their boat is shipwrecked and they find themselves on an isolated island with no signs of human civilization. However, the happenings around them make it possible that they are not alone. After exploring the island, they walk back to their camp to realize that this is a certainty. Someone has cooked hot dogs for them and their beds around the fire are turned down. Who are the other inhabitants of that island? The author captures reader attention with detailed descriptions and wonderful images. The fairytale effect of the plot is enhanced by effective word choices which also make the story come alive. The characters of Janine, Justin and their parents are well sketched. All the other characters in the story are also well portrayed, keeping up the fluidity and pace of the story. There is magic and mystery in the plot as the story progresses, keeping readers glued till the very end. Readers will definitely enjoy this read. It's light, breezy and magical, and any vacationer will love it. The plot is refreshing and original. Though the plot is simple, the story does have its moments of mystery and unexpectedness that subtly run throughout. I enjoyed the book thoroughly. It has everything in it that makes it an exciting and whimsical read. In An Unusual Island by D.L. Finn, Janine’s parents won a fabulous vacation on a private island. If that wasn’t awesome enough, the vacation is for the week in which she and her twin brother will be celebrating their 16th birthdays. A lot of sun, fun and a bunch of people to treat her like a queen: that was what she had in mind for the vacation. But things did not turn out quite as she expected when her parents decided to take a ride in the boat. With a little encouragement from her brother, they go out on the water. They are all having fun, but not Janine. Her brother notices some neon creatures that he is sure have been following them, but no one believes that. Neon creatures do not exist. A storm and some injuries later, Janine and her family find themselves on an isolated island. They try to find some people on the island, hoping that they could find help and get back to their vacation, but they cannot find anyone. Not a single soul. But there is someone on the island with them, all right. Nothing seems real, but it appears as such. Can they trust their invisible “friend” or is there something sinister on the Island? D.L. Finn wrote an amazing tale of adventure and fun. Janine is funky and her brother is a goof, but rather adorable. The mystery is pretty much evident after a few chapters and the reader is fully invested in the story by then. It was easy to read and like because the characters were real. A good novel and very enjoyable. A fun read! After Janine’s mom wins a dream tropical vacation for her family, things start to look up for the teen. A week on a tropical island sounds like the perfect way to celebrate her Sweet Sixteen birthday. 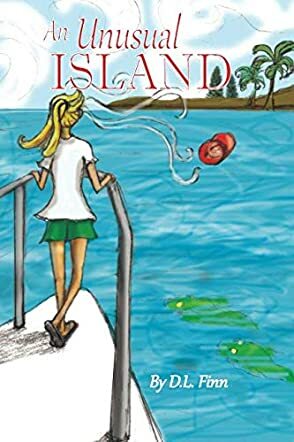 After reluctantly agreeing to go on a boat ride with her family during hurricane season, Janine realizes her perfect island retreat won’t be as relaxing as she had originally hoped, mostly because a day on the open water isn’t her idea of fun. Unexpectedly, the ride becomes choppy and hard to manage, and the family finds themselves on a strange island in the middle of nowhere. D.L Finn does a great job of providing page turning suspense as this family attempts to find other human life throughout An Unusual Island. The twists and turns found in An Unusual Island by D.L. Finn drew me into the story from the very beginning. Despite being twins, Janine and Justin couldn’t be more different. Janine is more reserved and into her books and schoolwork, while her twin brother Justin plays the role of the popular jock. After arriving on the island, the family is grateful to be saved with only minor cuts and bruises; however, they quickly realize they are not alone and start to experience strange events that cannot be explained. The look of the island seems so inviting and familiar to this family, but the reasons why were completely unexpected. I truly enjoyed this novel because it draws you into the storyline from the first few words.